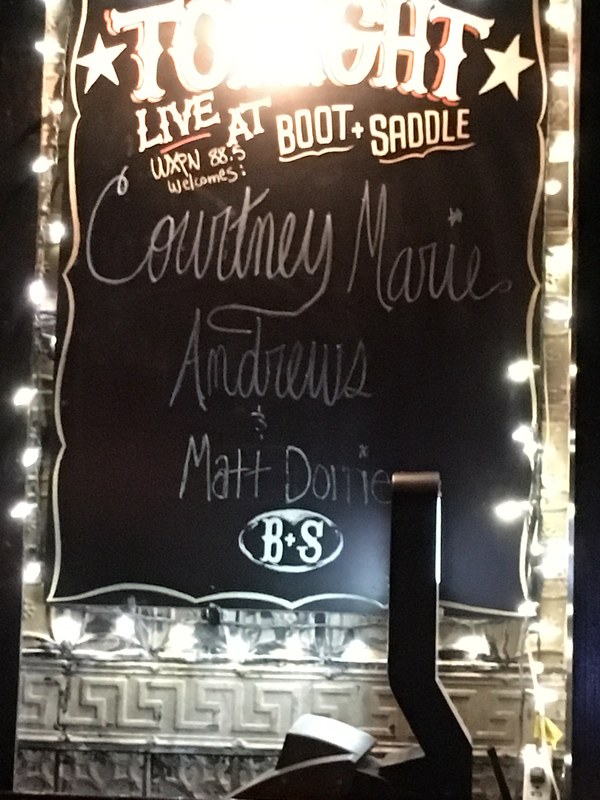 I witnessed the past, present and future of American music in South Philly last night, at a club called the Boot & Saddle. 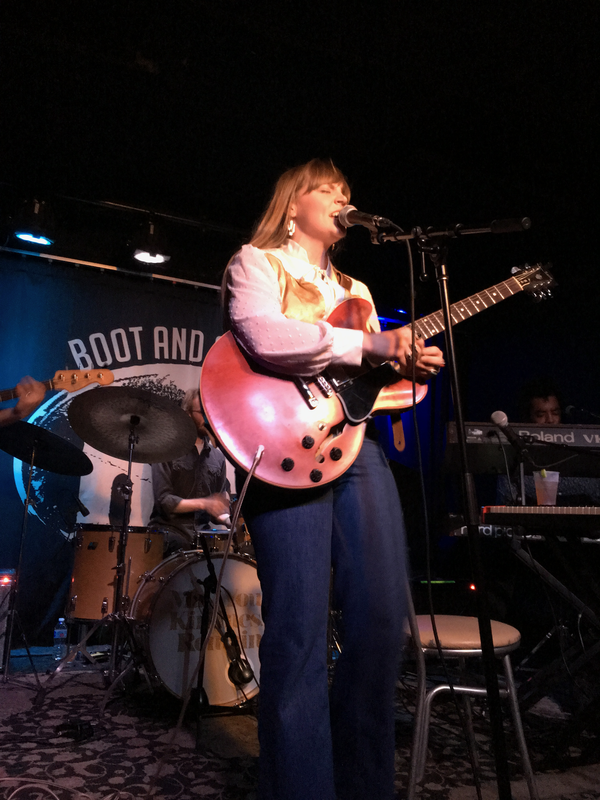 There, on a small stage that doesn’t have a proper exit, Arizona-born singer-songwriter Courtney Marie Andrews and her crack band integrated country, rock, folk, R&B and gospel into a sonic whole that echoed both the ages and the soul. It’s the sound not of a generation, but of the generations. If that sounds hyperbolic, so be it. But consider this: Just as A.P. Carter disappeared into the Appalachian Mountains to mine (and write) songs that provided sustenance to a hungry nation during the Great Depression, and he did, in the decades since every artist of note has learned from, and been inspired by, the music that came before, and provided an intangible that made bad times less bad and good times even better. It’s a never-ending chain, in a sense. Courtney Marie, to my ears, is the latest link. It’s more than just her, however: It’s also us, the fans and listeners. Just as a Bruce Springsteen concert reinvigorated a dispirited Jon Landau in 1974, and inspired the famed (and oft-misinterpreted) line, “I saw rock and roll future and its name is Bruce Springsteen,” so, too, did last night’s show for me. It was everything good not just about music, but about life. When we saw Courtney Marie at the same venue last year, the crowd was sparse. Last night wasn’t sold out, but looked to be at least double – about 100, give or take. (The venue holds 150, I think.) Which is to say, word is getting out. A guy next to us discovered her last week by way of NPR’s First Listen, for example, and then heard her on WXPN. He compared her vocal prowess to Linda Ronstadt’s. 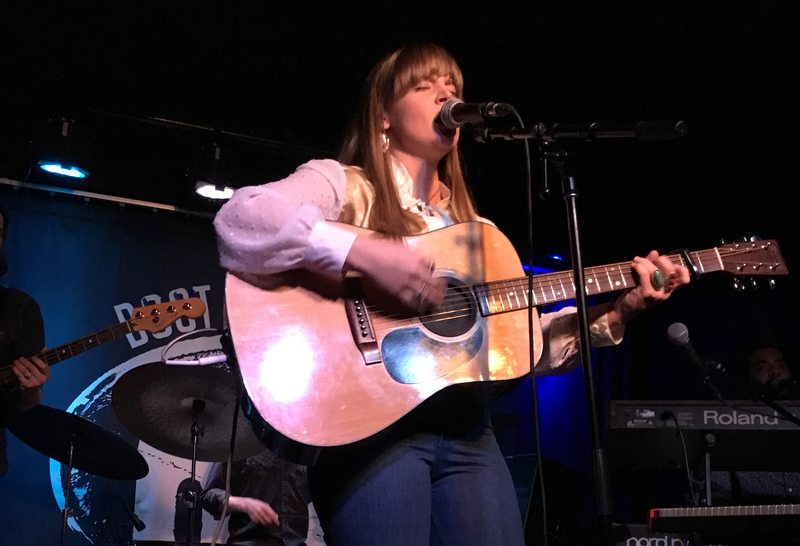 The set opened with “Two Cold Nights in Buffalo,” in which Courtney Marie turns a snow-enforced stay in the Nickel City into a sharp-eyed ode about the gentrification of American life. Our cities and towns are gradually becoming cookie-cutter replicas of one another, trading their unique charms for the same (or similar) chain stores and restaurants, cafes and overpriced housing. The mom-and-pop stores of yore are fading away. Another highlight came early: “Near You,” a hypnotic song Courtney wrote seven or eight years ago, but only pressed to vinyl last year. Dillon Warnek was simply phenomenal on guitar; he reminded me of Gurf Morlix and/or Kenny Vaughan. “Rough Around the Edges,” one of my favorites from May Your Kindness Remain, simply ached. 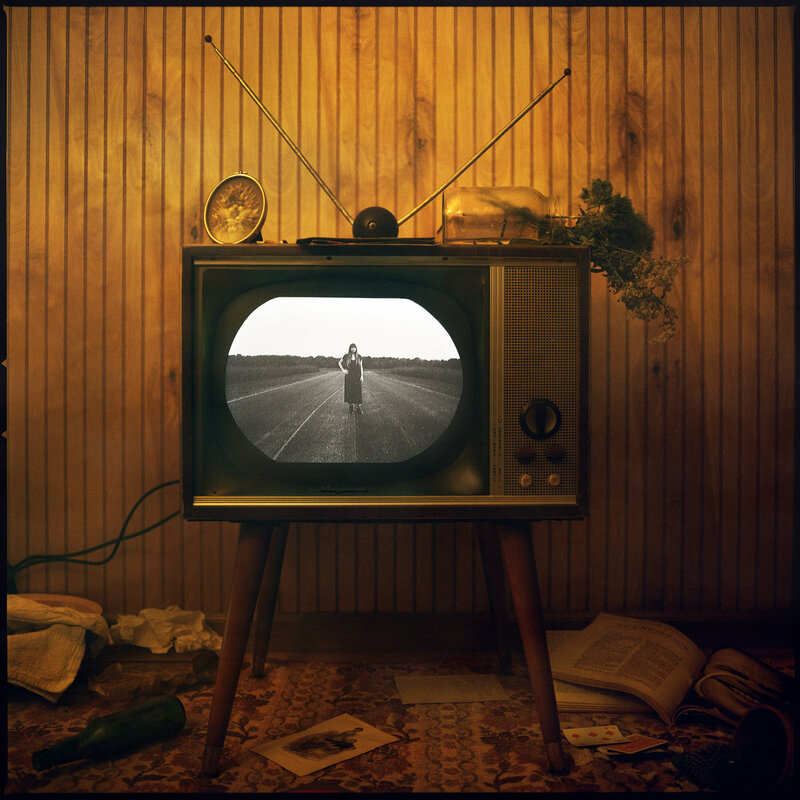 At one point or another, everyone says something they wish they could take back, wants to escape by sleeping late, and feels cursed by questions we can’t answer. The title cut to Courtney’s May Your Kindness Remain album was akin to attending a revival meeting (which I say without having been to one). 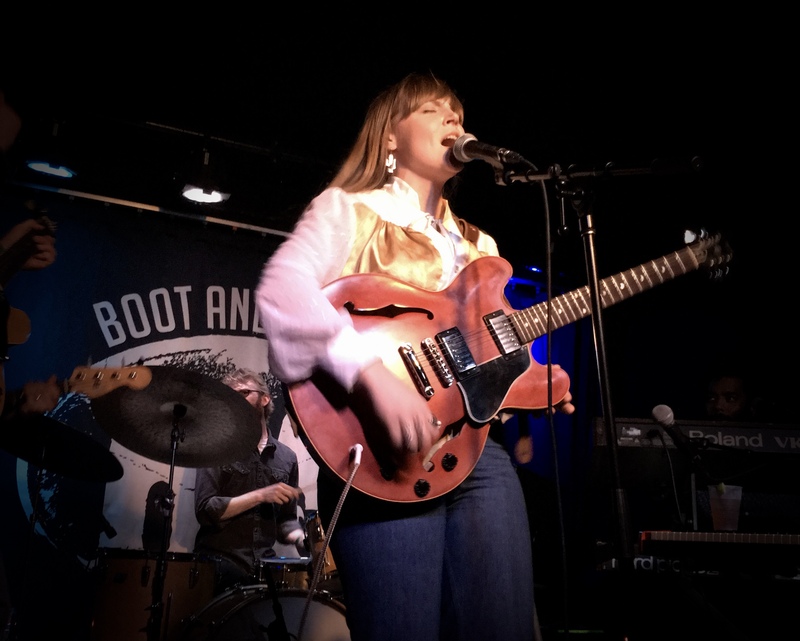 When Courtney Marie and band went to leave the stage after said Stax-Like Song, they realized they couldn’t without walking through the audience. (The stage door at the Boot & Saddle is literally next to the stage, not on the stage.) So they played the encore without actually forcing us to play the suspense game. Courtney Marie then met with fans at the merchandise table (Diane got a nice T-shirt; I got the vinyl for “Near You.”) We ran into Dillon in the bar itself, and had a great conversation with him about music past and present. He’s a great guy in addition to being a great guitarist. Anyway, there was no setlist to steal (or take a picture of), so the set is based on what I recorded, snippets of songs from my iPhone’s “live” pictures and memory. I may be missing a song or two, and likely misplaced “Kindness of Strangers” in the set order.